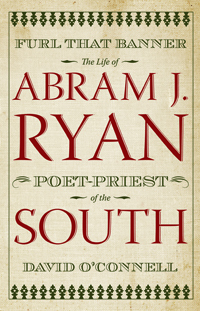 In 1879, Abram J. Ryan’s name was a household name in the South, especially after the publication of his book Father Ryan’s Poems. Republished a year later with a new title, Poems, Patriotic, Religious and Miscellaneous, and under the imprint of a Baltimore publisher with a national distribution network, it would go through forty editions until 1929. The two most important poems were “The Conquered Banner” (1865) and “The Sword of Robert Lee” (1866). These works were committed to memory by three generations of school children in the South until about the middle of the twentieth century. Margaret Mitchell, who knew them by heart, included Ryan as a character in GWTW because of her admiration for his work. Ryan was the editor of the Banner of the South, an anti-Reconstruction newspaper, in Augusta, Georgia, and popularized the term “Lost Cause”. His outspoken views with regard to the policies of the federal government caused him to lose the support of the paper’s owner, Bishop Verot of Savannah. When the paper was closed down, he moved to Mobile, Alabama, serving as a parish priest for ten years. He also spent three of these years (1872-1875) as the editor of the Catholic weekly of New Orleans, the Morning Star and Catholic Messenger. Until now, no one has been able to understand why Ryan left the quiet life of retirement in Mississippi to begin preaching around the country to raise money. Based on the study of the heretofore unknown correspondence between Ryan and two nuns in a Carmelite convent in New Orleans, Ryan became convinced that he could save his soul by devoting the last years of his life to paying off the mortgage on their convent. Tragically, he worked himself to death in this endeavor. This book is the first to place the Ryan story in its proper place.